Kefir makes for a creamy, probiotic rich drink that when combined with blueberries renders one ultra-healthy and delicious smoothie! Including fermented food and drink into your diet is vital for optimal health. Fermentation increases the nutrients, enzymes, and beneficial bacteria (probiotics) of food. Poor gut health is linked to numerous ailments. Keep your piping healthy by regularly consuming fermented food and drink such as kefir. A traditional fermented beverage, kefir is rich in the “good” bacteria that live in your digestive tract. These friendly flora are responsible for digesting your food, helping you assimilate nutrients, and play a critical role in the health and effectiveness of your immune system. Their importance cannot be overstated. If you’re new to fermentation, kefir is great place to start. I make my own kefir at home with both raw cow and goat milk. It’s the best! Store bought kefir is good, but not nearly as potent or healthful as making it yourself. For those interested in making your own, it’s easy and inexpensive. Find someone with kefir grains to spare (ask around at farmers’ market, health food store, co-op, etc) or purchase online (I got mine from the appropriately named kefir lady for $20) and you’re off. My grains are still going strong after two years. Ideally, you’ll want to use raw milk for kefir making, but store bought organic will do, just know the health benefits won’t be nearly as great. For the vegans out there, I haven’t forgotten about you. Young Thai coconut water kefir is an excellent alternative to milk kefir. This recipe is pretty basic and ripe for multiple add-ons and tweaks in the direction you desire. Enjoy! Place all of the ingredients into your high-speed blender and blend for about 30-45 seconds or until nice and smooth. 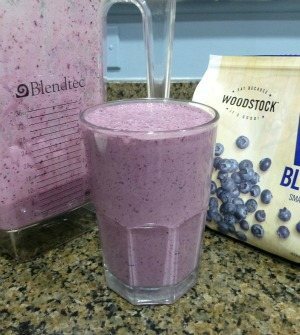 I’d love to know if you tried and enjoyed this blueberry kefir smoothie – please let me know in the comments below. Happy Blending! Yummy, yummy! Just made this. My teen said, “This is SOOO good!” I added a drizzle of honey, and a drizzle of coconut oil and it was surprisingly good! Hey Tiffany, surprisingly good? You shouldn’t be surprised that a smoothie recipe of mine taste good :) Just kidding. Nice touch adding the coconut oil. Cheers, Ryan. Very nice, Larissa! Can’t go wrong with a little dandelion root powder. It was very good! The cinnamon was a surprise in this mix to me and adds so much. I only used 1/4 of a fresh banana since that flavor can dominate to my taste buds, used frozen blueberries and the 1c homemade whole raw cow milk kefir, the t. coconut oil, a flax seed mix with chia, omitted the maca and cacao and used about 1T of my vanilla grassfed whey protein powder. It was really good! I will be making this again for sure! Thanks! Great to hear you enjoyed this smoothie and will be making it again. I love that you customized it based on your preferences and ingredients. Kudos for making your own kefir from raw milk! Don’t forget to soak your chia seeds in water for a half hour or so before you throw them in your smoothie! They’re much better for the pipes that way. Funny-I made pretty much this same smoothie before doing a search for raw kefir recipes and finding this! A little vanilla extract is good too. The cinnamon does make a big difference. i have been making the most amazing kefir smoothies lately. Your kefir recipe looks delicious – thanks for sharing! This was my first recipe I made with my newly “adopted” grains. The first taste was like, “Whoa!” and I wasn’t so sure, the next sip was like, “Oooh…” I think I’m hooked! I did the recipe as written above and added 1T of flax meal. I think I found my new breakfast! I made a similar smoothie for breakfast. On a kefir and blueberry kick lately. Without these smoothies…we would have nothing to kefir but kefir itself. Just made this – 7 months pregnant dealing with constant nausea. This is very good ang gets me great nutrition easily. What I used was frozen mixed berries (still mainly blueberries), used Tbs of organic shredded coconut instread of coconut oil (can’t stand that during pregnancy), jelled the chia seeds in some coconut water, used Sunwarrior plain raw vegan protein powder and did a dab of maple syrup as sweetner. Put in everything else! As others mentioned, I too love the little kick the cinnamon gives it. Nice touch! I love this. I added coconut oil , Stevie and macha powder for add ins. Do you have to soak chia seeds prior to adding and do you suggest coconut oil in addition to and how much coconut oil? Thanks Diane. You do not have to soak chia seeds. You can to make a gel if you’d like. Chia seeds and coconut oil go well together. Start with 1 teaspoon of coconut oil and work up to 1 tablespoon. Thank you, thank you, thank you! An amazing smoothie which I am having right now! I’m allergic to bananas. Will eliminating bananas have any negative effect? No negative effect except that the smoothie might be kind of runny. Try using 1/2 avocado. I’ve been making homemade Kefir smoothies every morning but I’d like to make a bigger batch and drink a cup or so each day. If I do that, will it last and for how long? Smoothies will keep in the fridge for several hours, Christy. Frozen smoothies will keep for weeks. You could make one big batch, separate into serving sizes, and freeze. Then take one out each morning (or night before) depending on how fast they thaw. Great! I love it! My first time to try kefir. I added flex seeds, coconut oil and honey. You’re welcome, Samira! Great to hear you loved it.